Gene Strotman, age 92, of Aurora, passed away Thursday, March 2, 2017, at Memorial Community Care. Funeral Services will be held at 10:30 A.M., Monday, March 6th at St. Mary’s Catholic Church in Aurora. Rev. Dhan Raj Marneni will officiate. Interment will be in the Aurora Catholic Cemetery. Visitation will be from 5 - 7 P.M. Sunday at St. Mary’s Catholic Church in Aurora, with the Rosary at 7:00 P.M. Memorials may be made in care of family to be designated at a later date. Higby-McQuiston Mortuary is in charge of arrangements. Condolences may be e-mailed to the family through the mortuary website at www.higbymortuary.com. 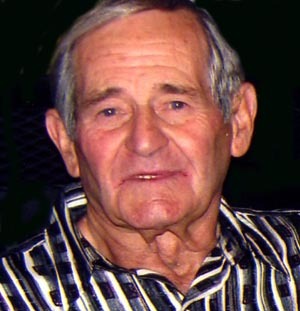 Eugene Joseph Strotman, the son of Fredrick Christian and Julia Mary (Van De Walle) Strotman, was born at Aurora, Nebraska on June 9, 1924 and passed away in Aurora, Nebraska on March 2, 2017, at the age of 92. He grew up in Aurora. Gene attended country school thru 8th grade and graduated from Aurora High School in 1942. He helped his father farm and when they had “The Strotman Dairy” he delivered milk to residences and businesses. Gene was united in marriage to Georgia Ann Becker on August 12, 1947 at St. Mary’s Catholic Church in Aurora. They purchased a farm just 1 ½ miles east of Aurora. He had cattle and farmed until he and Georgia retired in 1988 and moved to Grand Island. They had been married 65 years before Georgia passed away on January 6, 2013. Gene moved back to Aurora to be closer to family. Gene was a member of St. Mary’s Catholic Church in Aurora. He was preceded in death by his parents; wife and two sisters, Leona Jensen and Bethel Kolar. Those left to cherish his memory are his two children, David (Linda) Strotman and Shari (Randy) Asher all of Aurora; 3 grandchildren, Becky (Chris) Peabody of Plattsmouth, Matthew (Niki) Strotman of Bennington and Sara (Adam) Darbro of Aurora and 5 great-grandchildren, Blake Peabody, twins, Sam & Luke Strotman, Riley & Calan Darbro.